Wasn't expecting it that early lol. Isn't Feb 26 still Winter? but I think PS4 will crash Wii U also in Japan, earlier than someone expected. For sure it will happen but i don´t think before the End of 2015. The gap will be bigger after this Season at first. i don´t know what to expect from the WiiU this holidays but i think it will sell more than the PS4. If we take this week's differential, it will take like 400 weeks for the PS4 to exceed the Wii U. Like... even if the Wii U stopped selling any units and the PS4 magically increased to 20K a week tomorrow it would still take 60 weeks. It's not passing the Wii U in 2015. It may never pass the Wii U, as both are probably destined for terrible numbers. 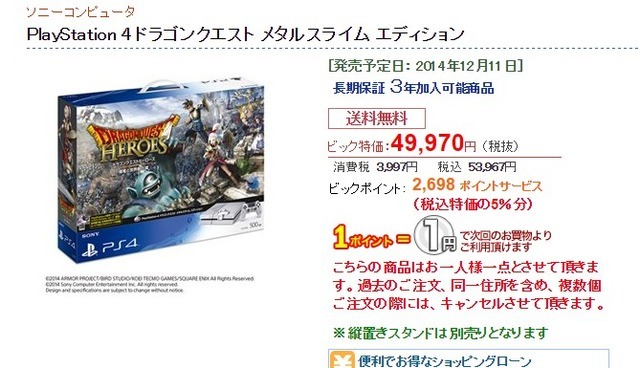 Only 300 PS4 Dragon Quest units up for pre-order... (at first). $500 and with a download code for a game that will be released in four months. 300 units is an overshipment. Dragon Quest Heroes coming February 26. The staff who said spring was from Okinawa. So it makes sense february since is when spring starts there. I'm sure we'll get an Hyrule Warriors 2, either this gen or next. the ps4 will probably be on the market in 2019, selling 5k a week, and the wii u won't even be counted. it should pass the wii u at some point in 2016 when the wii u is selling 1k a week and the ps4 is doing around 20k. vita-centric developers will probably go ps4/mobile/pc. sega is probably a sign of things to come. Including all the DLC and new content. I reckon they could probably do a (N)3DS game even if not a direct port. Of course a separate game to celebrate the handheld games would be best. Yeah, that would make for a nice launch game ! I see a beat doc. People still care a great deal around these parts so I have to assume they do elsewhere. Don't you remember when that Monster Hunter Frontier game was announced for Vita? So many people here had reverse meltdowns until they realized what it was. Do you have any link to those meltdowns? Do you see MK8 clearing a million now that it's being bundled? They said that in September and we already had a precedent: MH3G announced in September and released in December. I don't think Q1 is going to be packed like the release schedule currently shows. I expect a lot of games will be delayed. Delayed for reasons other than the game needing more time. Morita said that after their notable TGS presentation, though. Once September was over it should've been clear he wasn't talking about a new game. At what time do I get find out about QoL NintenDOS? And what happened to the game that was supposed to help PS4 this holiday? Without the game? Or is it the reservation? Edit: ah thanks zeromcd73, maybe this Christmas won't be a tragedy for the PS4. There's a question about Hyrule Warriors' performance, where they answer that they can't outright say if it has surpassed the 500k goal because Nintendo is responsible for overseas publishing, but they mention Japanese sales were in line with what was expected but overseas sales are above expectations, so much so they can even hope for even higher sales outside Japan due to more shipments in the second half of the fiscal year. Good for Koei. Hopefully they'll get the chance to make another one with more Nintendo characters, 'cos a "normal" DW title will be doomed. I hope that means better working r/s between Koei and Nintendo here, which leads to more WIi U games. I don't think there's anything wrong with the working relationship to begin with. If there was would HW even exist? TK will continue to put games on it that make sense to do, I doubt the working relationship is the issue. Koei will work with anyone to make another DW type of game. That's why we're getting Dragon Quest Heroes. Probably more like early 2017. The PS4 might make up some of the gap in 2015, but will be destroyed in the holidays. Same goes for 2016 where the Wii U will outsell the PS4 during the holidays, but it won't be enough to make up for the beating during the rest of the year. EDIT: and what do you mean the gap will only be bigger at first? Is the PS4 primarily going to outsell the Wii U with only its good intentions? Thanks Road! Very kind of you! I was also pleasantly surprised from Hyrule Warrior's sales outside of Japan - 190k for USA in 11 days is great, especially for Wii U.
Hopefully Nintendo mentions the title in their Q2 report; I'm expecting 500k shipments, excluding Japan. Eeeeeh. I'm with on on 2015. The Wii U will no doubt murder the PS4 around holiday time 2015 unless a surprise release like DQXI (lol) or FF15 comes around, but will the Wii U even be like...alive in holiday 2016? I have my doubts. The PS4 will still be sold by virtue of Sony still supporting it at least for the sake of the west but the Wii U might even be ramping up for a successor by then. Well what do we have on the PS4's side? FFXV and Kingdom Hearts 3 will be major titles, but they're likely to not come out until late in the system's life. Anything other than those? I'll take a WinBack remake/HD remaster please, Koei. There's plenty of western support and there will be some first Sony party support inevitably. Neither of those equals big numbers in Japan, but by that point it's uncertain whether Nintendo will even be supporting the Wii U in a significant way by holiday 2016. It's not that I believe the PS4 will suddenly take off, but I'm doubtful the Wii U will even be getting 1 release a month at that point. What's "late in the system's life"? 2017 or 2018? It just seems a strange proposition that SE's Japanese development arm won't have any major console titles for the global market for 3 or 4 or 5 years after the launch of the new hardware cycle. How exactly does it even stay in operation if it isn't releasing anything.